Hello! We have our gunite shell poured and are waiting for backfill and plumbing. I cannot make a decision on pavers, tile,or plaster. Also, I think I want step markers but can't decide that either! Here is the pool so far. These are our inspiration pics from builder. I'm not 100% sold on the type/ color of rock but overall like the natural feel. I think im going with these pavers: they are called McKenzie Blend from US Paverscapes. Wanted travertine but can't really afford the upgrade. The first picture was from showroom and the accent color is what I would use for coping. The second picture is at a place of business and it was laid several years ago.The third pic is from paverscapes website with matching coping instead of contrasting. I will have about 1500 sq feet of decking, including 600sq feet under the patio roof. I think I want to go with a natural waterline tile instead if a blue. Here are some samples next to samples of pavers. Only have a few pavers so not a good representation unfortunately. Am am I heading in right direction? I was thinking of a less colorful paver so it would not compete with stone. But my PB says it will be boring because I have so much decking. As i look at pictures all together I'm not sure pavers go with stone. But I haven't even looked at stone yet to make a decision on that. I also have step marker tile question but maybe that should wait till I've narrowed other choices. Thanks for for taking time to read this long post! First, wow what a clean gunite shoot! I like the pavers in the second pic where different pavers are different colors. I don't like the first one where each brick is split 50/50. Looks very manufactured. As for waterline tile, we matched ours to our decking. In hindsight, I wish we went something darker and more contrasting. Since we have light color travertine, it also makes our water appear lighter. Lastly, have you considered a contrasting coping color? It really defines the pool shape and yours is beautiful! Jen, as for step markers I would do your shelf and benches at a minimum. We did all of ours including steps and really like them. But it seems you have more steps and other accents in your pool that it might take away from (spa, table, etc). If you have children definitely do more markers than less. Last thought is to consider marker tile grout choice if you are going with strips of tile like subway or 1"X1" squares. Ideally you want it to blend with your plaster/pebble finish so it's not noticeable and the tiles stand alone, unless you specifically want a contrast to the finish and more of a connected look. thanks for your input. I see what you mean about the pavers, although according to the manufacturer it is all the same color. I definitely like the 2nd one better. I would like a contrasting coping, that's what I was thinking about the first picture with the tan edge. The samples I have do show the pavers split in half and that is actually what I didn't like but didn't realize it. I may may have to drive down to showroom again. It's nearly 2 hours away though so I have to plan that and this time take someone opinionated (like my hubby lol) with me. If you go with stone, there will be natural variations in color. See my French pattern travertine below (all ivory color). If you go pavers, it will be a much more solid consistent color unless the design or mix is specific to produce a different look (like those you have above). Do you have a friendly contact at the showroom? Could they shoot you a couple of pics of material to make your decision to head there easier? Getting to spend some money today! Oh yeah! I am with Grunpie-I like the more even colors on the second picture (the one on the right) of course that could just be a matter of time on the pavers but is sure is pretty. I would go darker on the water line tile as well OR go with a darker coping to accent your pool shape. Again I agree with Grumpie! If you go contrasting/darker on the coping it will break up the water line tile and deck. I would NOT try to match the waterline tile to the coping or pavers. The pops of color can come from the pillows, towels, floats, water guns, etc in and around the pool. I agree with Kim - I like the look of the darker coping and lighter decking material. I went with a dark gray coping material and standard brushed concrete, but definitely like the look. If I had the budget, I think I would've went with a similar coping but a light travertine paving material. I would love some bling! Just don't want to over do it, for looks or budget lol. But I LOVE the lines of glass tile around the steps and such. I do have kids (6- from 10-22years) plus my 72 year old FIL lives with us. That is why we have extra steps. Originally there were only the 3 steps from the beach to the bench and then One more. Too hard for him to navigate and no place for a handrail. The paver place does do custom blends- maybe I should drive down and see that they can do. Esloser-I love the contrast. That looks great. I would love a charcoal colored coping but I'm afraid in the Florida sun it will be too hot. Don't get a ton of shade although I will have a screen enclosure that should help a little. I had a hard time deciding on finishes, especially since it can be hard to visualize from a sample how it will look installed. Initially we had opted for a waterline tile in dark grey slate with bluestone (pale grey stone) coping, thinking a natural look would be elegant. But I was really disappointed with how it turned out. It was really boring. We ended up replacing the tile with glass tile from NPT (arctic ice), which we love. It is iridescent but not overly colorful. We used 1x1 tiles and for step markers, a single row of 1x1s. Oh wow! That is beautiful! That is exactly what I want for step markers. It does look amazing as waterline too. The problem I have is my PB uses LuvTile and they don't have anything that pretty. Wonder what my credit would be for the included tile and if I can apply to NPT. I've seen it before and I love it. Ice is the lightest bluey/greenish color, but its iridescence makes it look like mirrors and it picks up a lot of the pool color. We used light grey thinset and light grey grout to enhance the color. Your pool looks amazing. Personally, I think glass tile would look incredible with those curved areas. We had wanted a fairly traditional look (not too blingy) but the glass tiles were our biggest happy surprise with the build and one of our favorite features. Mama one thing you will REALLY need to watch is the skill of the step tile person. With the curves it will add a element of difficultly. I have a link to a pool you might like to see. It uses the natural colors. I linked to the last page but there are many pictures through out the whole thread. MommaJen!! I love your pool! This is going to be fun! You're going to get more opinions than you know what to do with! Lol!!! First of all, do you have a build thread with the pool plans or diagrams and pictures of the overall area showing the huge area to be decked and the back of your home? That would help. You do have a lot of decisions, and your choices are interdependent on each. So if you go for A on pavers, you may want D for waterline tile. Then if you see different pavers you love, you may need to change the waterline tile. Don't worry if you still keep changing things up for a while til you find your perfect combination of materials. Pavers: starting here since they bring out my strongest opinion. I don't like the ones in the pictures. On my computer screen (all these devices display colors differently), in all 3 pictures, the pavers look like they are all 50/50 - just different lighting and age of pavers. I agree with you and not your builder. There's a lot going on with your pool, and that gorgeous wooded area you live in. Maybe if you lived in an open field a multi-colored paver deck would break the monotony. I say let the trees and pool take the attention and not the deck. You mentioned liking Travertine. Most Travertine decks that I've seen have subtle shade variations between the stones. They aren't as bold as the paver pictures you posted. To me that says, maybe you prefer the subtle shadings which you can easily do with pavers, too. In fact, that could be a big reason you like Travertine. Here's one more thing to think about..... I have no idea where you are in Florida, but Travertine Mart is in Florida. I've read so much about it for several years and people have good luck with it. They ship/deliver. Their prices are usually better and their quality is supposed to be much better than what I probably got here in Houston. Check them out - never hurts to ask. 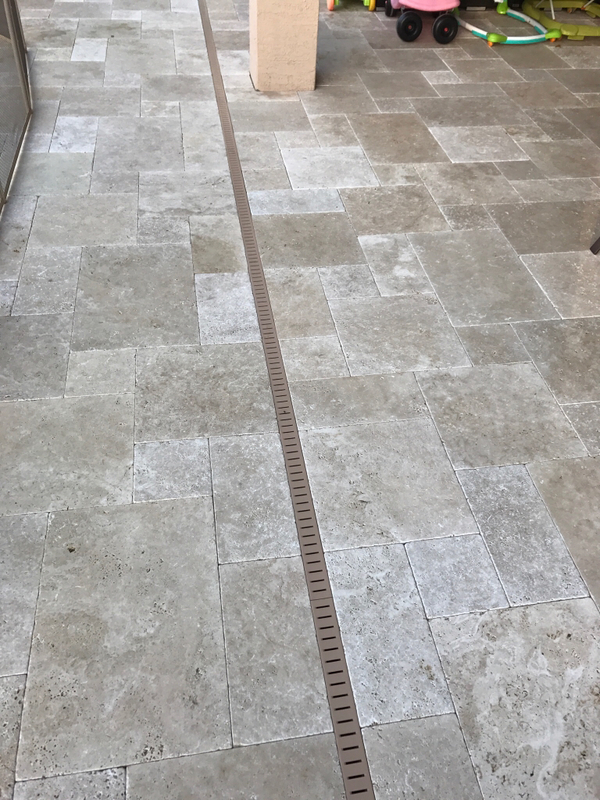 Travertine Tile and Travertine Pavers from Travertine Mart You buy it and then either your PB or someone else installs them. If still too expensive, I think you can get a similar look in softer colors with pavers. Coping: You mentioned two choices - natural rock or paver coping. Or, is the rock for a rock wall and spa only and something different for the pool coping (here is where diagrams or pool renderings would help) If pavers for the coping, I agree with you and use the one color. IMO the multi-color paver coping looks very dated. Many paver decks have variation in brick colors, but I like the ones that the different shades are very subtle giving it a more old world look (but not dirty). But....... I think your gorgeous trees and natural wooded area SCREAMS for the natural stone. And I'm not always huge on stones except in your similar looking location. The pavers your builder likes would take away from natural stone and compete with it. As far as contrast between decking and coping, I really like it. To me it doesn't matter which - light to dark or dark to light. Again, with your surroundings and wonderful pool design, you don't need to worry about contrasts going on and on - light, dark, light, dark, etc. One PB told me he always likes a contrast coping for safety reasons - it gives a subtle or subconscious 'heads-up' that the water is near as you're walking toward the pool. I thought that was a good idea, and it's pretty! Rock color: if you want rock, look to your natural surroundings for color choices. Tree bark, dirt, etc will help. Are there lots of shadows? Bring some different rock samples home and see how they look in your area. Step/bench/ sunshelf edge markers: Great places to get Kim's bling requirement met! Lol!!! I strongly suggest you wait til after waterline tile, coping, paver, stone decisions are made. You've got enough decisions to make for now. It will be easier to choose from 1000's of marker tile choices after those biggies (and fewer options than marker tile) are selected. Style: A decorator once told me to look in my closet and see what colors and combinations I like to use the most. Neutrals? Primary colors? Pastels? Bold colors? Monochromatic combinations, sharp contrasts, or subtle shade variations? Then look around your home - same questions. That will guide you better than anything. I do think hearing lots of different opinions and suggestions helps you clarify in your mind why you like what you do or gives you food for thought - something you hadn't thought of. And if you love the water as much as we all do, all these decisions won't matter one bit when you're floating and swimming and playing in your NEW pool!!!! I have a strong affinity for steps in a pool. That's awesome you thought to add more steps! Everyone will appreciate those! I'm so excited about your pool! It's always fun when we get to help pick out materials. If you finished reading this, you're more desperate for opinions than I thought!!! MommaJ, your pool is going to be GORGEOUS!! You got lots of good feedback from Suz and Kim, both have great eyes for detail! The pavers you posted are very pretty and colorful! I love the contrasting coping and a neutral waterline tile with bling for the step and bench markers. The decisions you have to make are not easy. I know I struggled with mine and second guessed myself, but Kim and Suz (and so many others!) gave me great feedback, and it all came together. Yours will too! New build on Florida's Space Coast!! Here a link to her build thread! I'm with Kim and I like bling. Everything is neutral in your choices brown/gray pavers, brown/gray stone. The unexpected - but successfully unexpected is what creates interest. Go bold. I think the waterline would be beautiful if it had contrast maybe a sparkly blue like the NPT Arctic lagoon or ice. You could also go for the drama and pick a very dark blue for the waterline tile and water color then a white capiz shell looking tile for the step markers. and I really liked the inspiration photos. I think it will be a beautiful pool whatever you choose. Thank you, Kim, for the link to her build thread! I got lazy last night!! SuzfromTexas- I did decide to check out the Travertine Mart website. The type i would like would be the ivory French pattern travertine. The price seems reasonable but I don't know what my allowance is for cement pavers. I contacted my builder and he said he will work up a quote for me. Then at least I know how far away I am from travertine. He said he will check his supplier also. I also showed the builder the NPT Artic tile. I can't decide on that though til I pick a paver. I really just just need to hire a designer. Lol. I looked at the rock for waterfall. We ar going with a moss fieldstone. We are stacking them around the spa hopefully. I'm a little worried if it will work though. Momma, ours is French pattern ivory travertine. If you go that route, have them send you a sample as shading changes over time based on batches from the various quarries. Our shade was a little darker than some other ivories I've seen, which is what we preferred (somewhere between ivory and walnut).